Keep working on your routines this week. Try them out, see if they’re working for you. (And, do I need to say it? If it doesn’t work for you, tweak it until it does.) In the meantime, let’s move on to the next part of the home reset – decluttering. Paper is my biggest nemesis. As a paper crafter, I have a love-hate relationship with it. Pretty paper, yes. Junk mail, no. There are receipts, encouragements to refinance my home, grocery sale notifications, information about monthly pool service (we don’t have a pool), bills, insurance information, statements, takeaways from events, things I want to put in a scrapbook…I’m sure you know what I mean, because you get some or all of it too. Don’t let me mislead you – I do not have a handle on our paper. Sure, I try to get the junk mail in the recycle bin or a bag to be shredded at work as soon as it comes in the door, but I don’t have a regimented routine for dealing with the rest of it. Instead, paper tends to live on a small desk in our living room and on a corner of our dining table. I deal with it when it bothers me – that is, when it starts to threaten to fall on to the floor or we are running out of table to eat on. This tends to be about once a month. In all honesty, when I’m working a normal work schedule and able to work from home on Tuesdays, the paper does get dealt with on a more regular basis. When I’m not – well, paper avalanches tend to be a more regular threat. Really, the upcoming folder gets the most use – it’s where I put stuff that we need that I don’t want to lose, like the boarding papers for the Alaskan cruise we took in September or the recall notification for one of our vehicles. Since I deal with bill paying all day, every day at work, my husband is actually the one who keeps the family budget and pays the bills. So, the bills don’t really tend to make it into the folder before being paid. We get the bill, he opens it and schedules it into online bill pay pretty much right away. Do you have a routine set up for your paper? How successful are you at managing it? Daily Challenge: For some, it’s on the dining table or kitchen counter. Sometimes it’s scattered. Wherever it is, collect the paper that has accumulated at your home, get rid of the trash, and handle the rest. (file? pay or schedule a bill? rsvp for an event? add something to your calendar? whatever it is that needs to be done.) If you have more than can be dealt with completely in 30 minutes, spend 30 minutes dealing with it and schedule as many blocks as needed in the future. If you’re having trouble finding blocks of time, consider processing while you’re doing something else like watching tv. On Organize 365 she has something called a “Sunday Basket”. 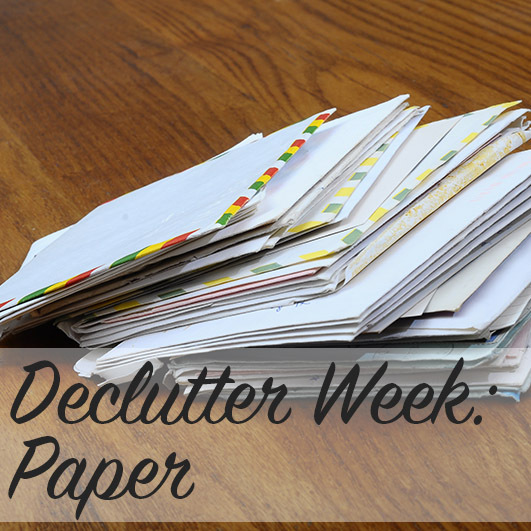 It’s a way to get paper clutter under control and also be more productive. I was skeptical at first because I’ve tried similar things that didn’t work for me, but for some reason, her specific system/explanation made so much sense to me. I love it and have never had paper under this much control before! !